But despite turmeric's meteoric rise from Indian takeout to superfood obsession (searches for it skyrocketed 56% from November to January), it's actually not overrated. Besides being used for thousands of years in Chinese and Ayurvedic medicine, turmeric's health benefits have also been backed up by modern science. Here are just a few of the ways it's good for you, and how you can enjoy it outside of a bright-yellow curry. Inflammation is thought to be one of the major factors in all kinds of diseases, and turmeric contains loads of curcumin, a powerful anti-inflammatory substance. No word on whether it works on politicians' speeches (hah!). It's been shown to alleviate joint pain, and can even help with heartburn and indigestion. Researchers are also looking at curcumin for its anti-aging properties, though more research still needs to be done. Curcumin is known for neutralizing free radicals, chemicals that damage healthy cells and membranes. That's what makes it a powerful antioxidant, according to Jennifer Christman, a corporate dietitian for Medifast. "It's perfect for home detoxes," she says. "Obviously our body naturally detoxes itself, but turmeric is something you easily can add into a tea or some vegetables, or whatever else is in your daily meal plan, without a lot of risks." That antioxidizing effect can help fight disease, including Alzheimer's, potentially. Curcumin, thanks to its wide range of effects, seems to help the brain resist buildup of harmful plaque in brains with Alzheimer's. You can't make this stuff up! 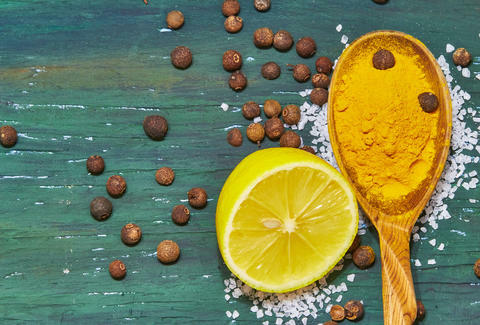 Well, you probably could, but that's what makes turmeric so incredible -- these benefits are being studied in real, live labs, and have the backing of legit organizations. When scientists discover that turmeric is effective in killing cancer cells and also preventing their growth, important heads are bound to turn. Research is still in its early stages, but according to the American Cancer Society, tests indicate that curcumin "interferes with several important molecular pathways involved in cancer development, growth and spread" and has boosted the effects of chemotherapy in animals. See? Pretty legit. Among those verging on type 2 diabetes, curcumin capsules seem to help stall the onset of the disease. The study that returned these results found that while a little more than 16% of people taking a placebo wound up with a diabetes diagnosis, no one taking curcumin received one. "It helps with so many diseases because of being such a potent antioxidant and anti-inflammatory," says Christman. Again, WHY THE HELL AREN'T YOU EATING TURMERIC? According to Christman, turmeric's mild, slightly bitter flavor works well typical stir-fries, but also in egg salad -- you can also put turmeric powder onto veggies, from peas to cauliflower. Or you can even be lazy and take a rounded spoonful a day. "A therapeutic dose would be more like two to three teaspoons a day, but you'd want to talk to your healthcare provider first," she recommends. "There haven't been any reported liver problems with turmeric (in humans), but high doses of turmeric have caused liver problems in animals, so you may want to avoid using it as a dietary supplement and just add it in." If Gwynnie's turmeric latte recipe is a little too much effort, Christman suggests drinking what's called a liquid gold tea. "A lot of people use hot liquid and coconut milk and put a teaspoon or two teaspoons in there with honey to sweeten it up," she says. "You can sip on that and it's a soothing way to reap those benefits." Not to be forgotten -- this superfood's bright-yellow hue can also be substituted for fake food coloring in baking recipes. How else did you think Kraft mac & cheese dumped processed ingredients without losing its token radioactive tone? The downside for the home chef is that you can expect your fingers to be stained yellow for days after chopping some fresh. "You likely won't reap health benefits, but it's a great way to get out of using artificial coloring," said Christman. "You'll only have to use a little bit, and it likely won't affect the taste." Barbara Woolsey is a Berlin-based writer who went to her local Turkish store and bought some turmeric after writing this. Follow her on Facebook and Twitter.